This FAQ is about how we do things at the Alaska Vein Clinic. If you have questions about vein disease or other issues concerning your legs, click this box. Do I need a doctor's referral to be seen at the Alaska Vein Clinic? No. Many patients with vein problems are in otherwise good health and don’t regularly see a physician. You may call the Alaska Vein Clinic directly and schedule an appointment or click the link below to request a consult online. What can I expect during my first visit to the Alaska Vein Clinic? The full consultation consists of a detailed ultrasound vein study and a consultation with Dr. Artwohl, who will explain basic venous anatomy, the results of your ultrasound study, and then outline the best treatment for your particular vein problem. 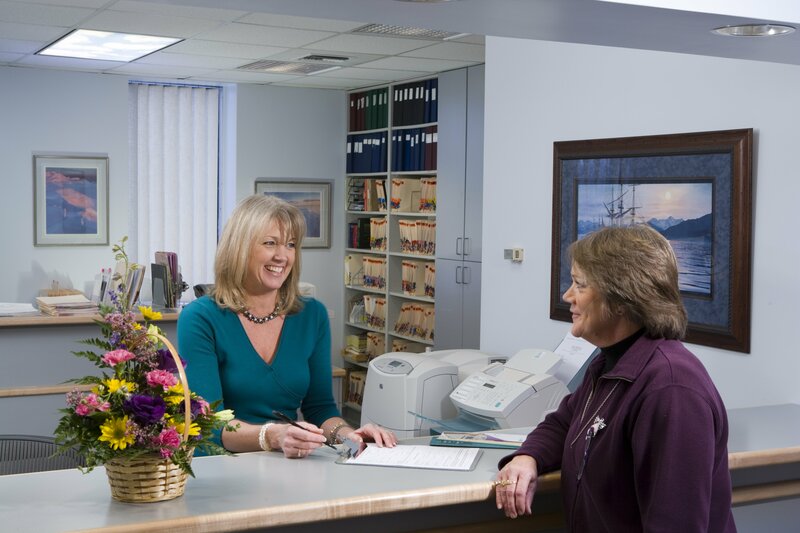 The Alaska Vein Clinic schedules plenty of time for you to ask questions and you will never feel rushed. When you leave our clinic, you will have a good understanding of your vein problem and the rationale behind the recommended treatment. If you don’t want a full consultation and just want to get some basic information about your vein or leg problems, you can schedule a free consultation. Will my vein problem be treated during my first visit? Not usually. The first visit will consist of diagnosing the cause of your varicose vein problems and detailing a treatment plan. Sometimes it is possible to perform a simple procedure during your first visit, but this an exception. In most cases, insurance companies require a period of “conservative medical management” before they will authorize payment for a procedure. Unless you are paying for a procedure yourself, whatever procedure you need will be scheduled after your insurance company confirms they will provide benefit for the intended procedure. This usually takes around one or two weeks. Who will actually perform my procedure? All procedures at the Alaska Vein Clinic are performed by Dr. Artwohl, who is certified by the American Board of Surgery and has over twenty years experience performing general and vascular surgery procedures. Where will my vein procedure be performed? Almost all of our vein procedures are done in the office, and take about one to two hours. For ClosureFast (radiofrequency) vein ablations, some patients request mild sedation. We usually sedate patients with oral diazepam (Valium by mouth). While this relaxes you, you are not “knocked out,” and you are able to converse with the staff during the procedure. Obviously, if you are sedated for the procedure, you will need someone to drive you home. About 60% of our patient used sedation and 40% do not. Dr. Artwohl will be happy to discuss this option with you. After the procedure, we will observe you for about 20 – 30 minutes, and then you are able to walk out under your own power. In the very rare cases, where extensive surgery needs to be done, Dr. Artwohl is a surgeon with full operating room privileges at Providence Alaska Medical Center. Most of our procedures are about as painful as getting blood drawn. We use local anesthesia which mitigates the discomfort. We can also provide sedation. After the procedure, most discomfort is very mild, occasionally requiring only a nonprescription pain reliever like Tylenol or ibuprofen. We do not routinely prescribe post operative prescription pain medications, as there is almost never a need for them. What is the downtime after venous procedures? There is little or no downtime and most people are able to return to work the next day. After most procedures, we ask you to wear support stockings continuously for four days, then for two weeks during the day only. During that time, we ask you to refrain from heavy lifting, straining, squatting, or other activity that may lead to a valsalva (bearing down) type maneuver. Venaseal requires no specific limitations on physical activity, but we still recommend a little common sense. You may, however, immediately engage in aerobic activity. Your follow-up care will be specifically written out at the time of your treatment. We see ClosureFast and Venaseal patients six weeks after the procedure. This allows us to evaluate the effects of the treatment on your symptoms and veins, and make further recommendations about treatment. We used to see patient 24 – 48 hours after ClosureFast procedures, but we never encounter any difficulties during that time period, so we stopped with this practice. At any time after the procedure, we ask you to call us with any questions or problems. If you think you are having a problem, our usual response is to have you come to the office and obtain an ultrasound study, which almost always shows a minor problem that requires no specific treatment. There is no charge for any post-treatment ultrasound or office visit in the six week post-operative period. We see sclerotherapy patients two months after the procedure. This allows us time to evaluate how the veins have responded and to see if any touch-up injections are required. What are the potential complications of venous procedures. Fortunately, post-procedure complications are extremely uncommon. Potential complications include failure of the vein to close, deep vein blood clot, superficial thrombophlebitis, infection, and bleeding. At the Alaska Vein Clinic, these complications have occurred in less than 1% of cases. We have never had a complication that required a hospitalization or lost time from work. We have done over 5000 procedures without a serious complication. What if I need a varicose vein evaluation or procedure and I don't have health insurance? Our office can usually work out a payment plan. We feel every patient with significant venous disease should be treated and we try to make it as easy and as affordable as possible to get the help you need. Do you ask for payment up front or at the time of my visit? Call us old fashion, but our usual practice is to bill your insurance company first and then bill you for the remaining balance. If you have difficulty paying your balance all at once, we can work out a payment plan with you. We are participating providers for most insurance providers, and accept Medicare & Medicaid. If you don’t have insurance, we can work out a payment plan.